We mentioned earlier how we’ve seen a lot of KFCs in Egyptian protest videos. 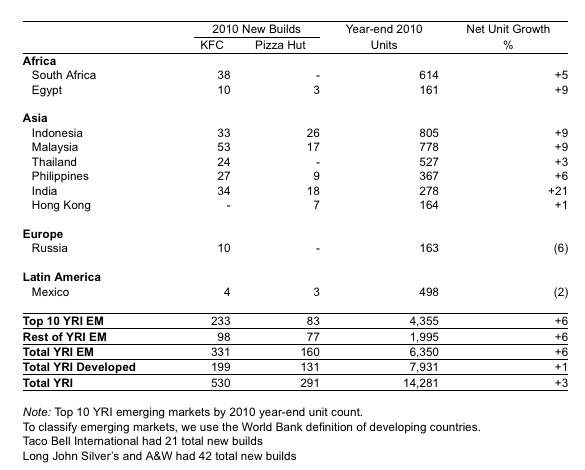 That’s because KFC — which, along with Pizza Hut is owned by Yum Brands — is a total monster in emerging markets (especially China, but not only). The company just came out with earnings, and so we have fresh numbers on emerging markets. Same-store-sales grew 6% in China and 1% in the U.S. Same-store-sales were flat in YRI. International development continued at a strong pace with 1,391 new restaurants including 507 new units in China and 884 new units in YRI.